The Rorate Mass inserts us ever more deeply into the Advent season, all the while uniting us to the pre-eminent Woman of Advent, the Mother of the Messiah. Editor’s note: The following homily was preached by the Reverend Peter M. J. Stravinskas, Ph.D., S.T.D., on the last of the “Rorate Caeli” Masses on December 15, 2018, at the Church of the Holy Innocents, Manhattan. We are celebrating the last of our “Rorate Masses” for this Advent. For the benefit of some new-comers, let me rehearse the meaning behind these special Advent Masses. These are liturgies celebrated in union with Our Lady, who lived that first Advent of nine months as she nurtured “the blessed fruit of [her] womb, Jesus.” We gather in the pre-dawn hours and offer the Sacred Liturgy in a darkness only illumined by candlelight to experience, even haltingly, the darkness in which our Jewish forebears walked as they prayerfully awaited the coming of the Messiah. In different places and times, the Rorate Mass was offered every day of Advent, or on the seven days before Christmas, or as a preparatory novena for the great solemnity of our salvation. The pre-dawn period, although eerie and still fraught with potential danger, also promises the rising of the sun; the pre-dawn fosters hope in us. Gathering in prayer on Saturday has been a traditional way of honoring the Woman who brings us to Sunday, to adore the “Sun of Justice” (Mal 4:2). Indeed, when unimpeded by a liturgical memorial or feast, Catholics always observe Saturday in union with the Blessed Virgin Mary. The Rorate Mass is also a happy blending of popular piety and liturgical worship. In December of 2001, the Congregation for Divine Worship published its “Directory of Popular Piety and the Liturgy,” which promoted a happy marriage between the two. In the immediate aftermath of the Second Vatican Council, not a few would-be liturgists denigrated expressions of popular devotion and impoverished the spiritual lives of all too many Catholics by reducing all our prayer to the Mass. To be sure, we must agree with the Vatican II Constitution on the Sacred Liturgy, Sacrosanctum Concilium, in holding that the Sacred Liturgy is truly “the source and summit” of the Christian life (n. 10). A source, however, springs forth into many tributaries; one reaches a summit only in stages, stopping off at way-stations to gain one’s breath or to appreciate the view. Similarly, devotions – properly understood and observed – contribute to a full and wholesome liturgical life, as the “Directory” points out. The Rorate Mass inserts us ever more deeply into the Advent season, all the while uniting us to the pre-eminent Woman of Advent, the Mother of the Messiah. This Mass gets its name from the introit or entrance antiphon: Rorate, caeli, desuper, et nubes pluant Justum (Drop down dew, ye heavens, from above, and let the clouds rain down the Just One), a plea taken from the Prophet Isaiah (45:8), the Church’s “particular” voice for this holy season. This was the petition of the Chosen People for 4000 years, and we enter into that spirit of longing symbolically through the four weeks of Advent. Notice that the prayer is for “dew” which, in nature, comes silently and is almost imperceptible. If dew is lacking, however, the results are quite perceptible. In Sacred Scripture, not infrequently, dew represents the presence and action of the Holy Spirit. Thus, in the Edward Caswall translation of the Pentecost Sequence, the Veni, Sancte Spiritus, we implore the Holy Spirit: “On our dryness, pour thy dew.” Dew can accomplish its purpose on grass; it has no effect on stone. And so, we ask for the grace of conversion, which will enable us to receive the Promised One. The Virgin Mother, however, was not merely a kind of holy incubator, so that when that Child was born, she vanished from His life – or He from hers. No, a mother is a mother forever. Indeed, she is the Queen Mother, seated at her Divine Son’s right hand – just like Bathsheba placed at Solomon’s right hand (cf. 1 Kings 2:19). And that Queen Mother was given to each one of us by the dying Jesus as His final and most precious gift to His brothers and sisters in the Church (cf. Jn 19:26-27). Beautiful article, Father. These Masses originated in Germany, and still today it is celebrated before dawn,in the light of many candles, on Wednesday and Thursday of Advent. Here in Europe we also call them the Mass of Watchers or Watchers’ Mass, because indeed we watch with Our Lady and the Patriarchs for the Advent of Christ. 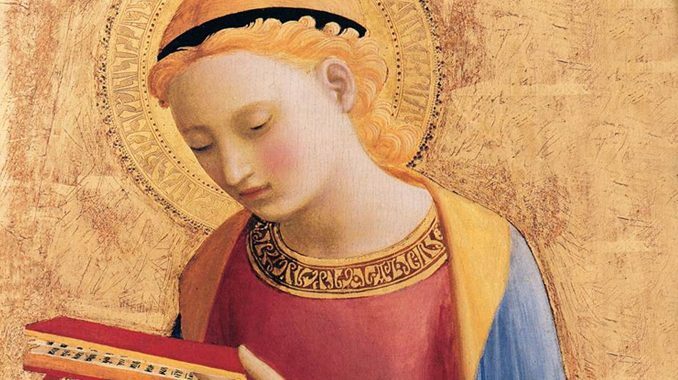 Could you send to me any teaching on ‘Mary being the Icon of the Holy Spirit’? I have serious difficult calling Mary the spouse of the Holy Spirit. There is no such inference in Scripture or Church History. We must neither add to or subtract from the Word of God. The Holy Spirit created a miracle in her, but she was not the spouse of the the Spirit. The Church is the bride of Christ, but the term “spouse” implies a physical, sexual relationship. I believe this is going too far and even against the Word of God.